• Government will use a two track policy. The first to implement pro-growth economic policies and the second to eliminate wasteful government spending. • The operating deficit and public sector borrowing requirement will be $331 million for the coming fiscal year. • The Budget revenue estimate for 2013-14 is $871.2 million, four per cent lower than last year’s original estimate. • Customs Duty has decreased by $25 million or 12.5 per cent compared to the previous year. • Payroll tax concessions for the hotel, restaurant and retail sectors will be extended, but will reduce the projected payroll tax collected by $21 million. • Under a best case scenario, Bermuda’s debt will continue to rise to just over $2 billion and decline thereafter. • The base case scenario, which is what the OBA expects will happen, is that Government debt will continue to rise to $2 billion over the next five years. • A worst case scenario would see debt rise to $4 billion in five years if Government does nothing and trends remain the same. • Government will ask for the debt ceiling to be raised to $2.5 billion. • Government promises faster approvals for work permits, planning approvals and company formations. • An Economic Development Cabinet Committee will work to created to help get new hotel resorts built. • There will be a two-year payroll tax holiday for new Bermudian hires at companies. • License fees for non-Bermudians purchase of Bermuda property will be slashed from 25 per cent to 8 per cent for 18 months before rising to 12.5 per cent afterwards. • Licence fees for condos will be reduced from 10 per cent to 6 per cent and after 18 months rise to 8 per cent. • For PRC holders licence fees will fall to 4 per cent before rising to 6 per cent after 18 months. 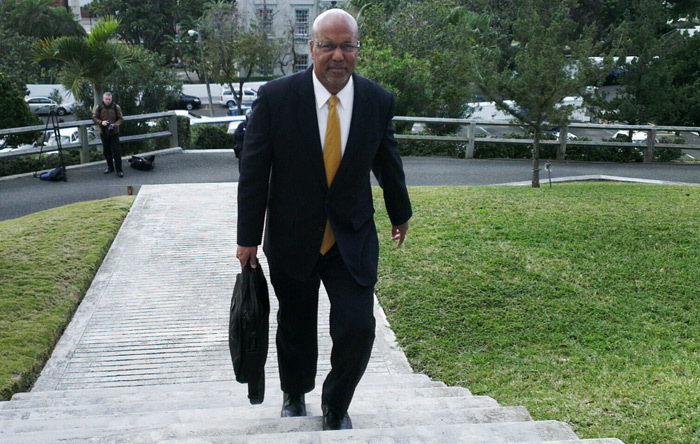 • The number of properties available to non-Bermudians will remain the same. • Taxes on cigarettes and alcohol will be raised to collect an additional $2 million in revenue. • ARV rates will go up on those properties above $90,000 (The top four per cent). The amount of additional tax is expected to be $3.4 million. • Seniors vehicle licences will be free for those in the A-D classes but those in E and above will have to pay. • There will be an increase in vehicle licence fees by three per cent. Government expects a $2.2 million increase in revenue from these two measures. • The cost of bus passes will be raised to collect an additional $500,000. • The Corporate Service Tax Rate will rise from 4 to 6 per cent to collect an additional $1.5 million in revenue. • Government will go after businesses who haven’t paid their taxes. • The Bermuda Police Service will get additional funding to hire more officers. • The Police Complaints Authority will get an additional $30k to hire a part-time investigator to properly deal with the public’s complaints. • More money will be given to corrections so it can fill existing vacant posts and also hire professionals in areas related to rehabilitation and management of inmate issues. • The Career Pathways programme will be expanded to eventually see it introduced at the middle school level. • More money will be allocated to special needs students. • The Health Ministry will get an increase of $4.2 million. FEB 22, 2012: We summarize the main points of the OBA's first national Budget, explaining where you'll pay more — and less — and why. For now, comments will be approved by the Sun prior to posting.